Brexit has continued to generate uncertainty in the real estate M&A and private equity markets as the negotiations for leaving the EU continue. However, the continued attraction of UK real estate to overseas investors confirms that Brexit must be considered in a global context to ascertain the bigger picture. To many overseas investors, the announcement in the 2017 Budget that gains made on direct and indirect disposals of UK commercial property by non-residents will from next year be subject to tax (as described below) is of far greater immediate significance than Brexit. Indications are that whether the UK is within the EU or not seems unlikely to affect the attraction of the UK as a place to live and work and where investors wish to spend their capital. Last year saw record levels of investment in central London from overseas buyers, with investment from the Asia-Pacific region, and in particular Hong Kong, once again at the forefront. Brexit notwithstanding, the UK remains a safe haven for investors from around the world wishing to spend their capital. The continued weakness of the pound, historically low interest rates and the relatively robust state of the economy have helped ensure that the UK remains open as a place to do business. The office market has seen a steady start to 2018 as lower investment levels have been offset by healthy occupier activity and a shortage of suitable available stock. Although take up has softened as businesses evaluate their post-Brexit strategies and requirements, there have been some significant deals, with Deutsche Bank committing to nearly 500,000 square feet of City space and Facebook confirming its requirement for up to 700,000 square feet of new space. The rapid growth of the co-working office sector has seen the emergence of significant new operators such as WeWork, which recently acquired the 620,000 square foot Devonshire Square estate. The demand for affordable, flexible and well-connected space with high levels of service provision has been fuelled by the new wave of tech and media occupiers and also by more traditional occupiers evaluating their longer-term needs. London is the leading European city for proptech and seems likely to remain so for the foreseeable future. The serviced office space boom has also extended to regional centres with a growing tech and media sector, such as Manchester, Milton Keynes, Cambridge and Oxford. The retail sector is going through a period of transition as traditional retailers re-evaluate their requirements for space and online retailers experiment with the use of physical space to showcase their products and lifestyle aspirations. Shopping centres and retail parks are also evolving to offer a more general leisure experience. Well-known names in the mainstream retail and restaurant sectors continue to struggle, including Toys R Us, Maplin, House of Fraser, Carpetright, Mothercare, Jamie’s Italian, Byron and Prezzo, while the luxury central London market continues to benefit from the enhanced spending power of overseas visitors. The industrial sector remains strong with demand for large high-specification distribution centres particularly robust in the logistics sector. Activity outside the traditional office, retail and industrial sectors continues to grow as investors look to alternative assets for new opportunities. Institutional investors continue to increase their market share in the private rented sector as traditional ‘buy to let’ investors have been hit by a less favourable tax regime. The specialist retirement living market has developed offering a wider product range to meet the growing demands of an ageing population. The hotel and leisure sector has benefited from high levels of overseas visitors and a growing ‘staycation’ domestic market. Investors have extended their interest beyond trophy hotels in the central London market and have been looking for value across the sector and outside London. The residential property market has fared better in the regions, where house price growth can be contrasted with stagnant or falling prices in London. The slowdown in the prime central London residential property market has continued and has spread to the wider London market. Overseas and domestic buyers have been deterred by inflated prices, oversupply, punitive rates of tax and Brexit, all of which have contributed to weak demand. Outside London, Manchester has been a particular hot spot that has benefited from the relocation of both public and private sector jobs from London. With regards to financing, there has been a decline in loan originations for UK property, with banks in particular taking a noticeably more cautious approach. However, alternative lenders have continued to increase their funding activity and market share. Significant new entrants in the non-bank lending market have included fund managers and insurance companies looking for relatively safe long-term returns. In one of Europe’s largest real estate transactions, China Investment Corporation agreed to acquire Logicor Europe from Blackstone Real Estate Partners for €12.3 billion. Logicor owns over 600 logistics assets across Europe. Employees Provident Fund of Malaysia and Permodalan Nasional Berhad have agreed heads of terms to acquire the Battersea Power Station Building from Battersea Project Holding Company for £1.6 billion. Land Securities Group and Canary Wharf Group completed the sale of the Walkie Talkie building at 20 Fenchurch Street to Infinitus Property Investment (Hong Kong) Limited for £1.28 billion. This is the largest single asset transaction in the UK. iQ Letting Property Partnership acquired Pure Student Living from LetterOne Treasury Services for £870 million. The Pure Student Living portfolio comprised eleven sites, which will be rebranded as iQ. WeWork Management, TH Real Estate and PFA Ejendomme have acquired the 13-building Devonshire Square estate from the Blackstone Group for £580 million. Blackstone and M7 Real Estate acquired the InfraRed light industrial portfolio comprising 40 properties from InfraRed Capital Partners for £320 million. Cheung Kei Group has acquired 20 Canada Square, Canary Wharf from Brookfield Asset Management for £410 million. Norges Bank Investment Management has acquired an 8.2 per cent stake in Shaftesbury PLC from Invesco for £245 million. Blackstone has acquired a majority stake in The Office Group from Lloyd Dorfman for an enterprise value of £500 million. The flexible workspace company has around 36 buildings mainly across central London. Legal & General agreed to acquire the 52.1 per cent interest in the CALA Homes Group that it did not already own from Patron Capital and the CALA management team. BUPA agreed to sell 122 care homes to HC-One, a leading provider of health and social care in the UK. BUPA retains around 150 care homes and six retirement villages in the UK. Tonstate Hotels agreed to sell the Hilton London Metropole and Hilton Birmingham Metropole hotels to funds managed by Henderson Park Capital for £500 million. A consortium of investors led by Midlothian Capital Partners acquired Park Leisure for £103 million. Countryside acquired the Westleigh Group from Palatine Private Equity for £135.4 million. Foncière des Régions agreed to buy Starwood Capital’s Principal Hayley hotel business, comprising 14 four and five star hotels across the UK, for £858 million. Secure Income REIT agreed to buy Manchester Arena in a £436 million acquisition of two leisure and hotel portfolios. Brookfield agreed to acquire Oaktree Capital Management’s serviced apartment business, SACO, for around £430 million. Frasers Centrepoint agreed to acquire four UK business parks including Winnersh Triangle from Oaktree Capital Management. Land Securities acquired a portfolio of three retail outlet centres from Hermes Investment Management for £330 million. Kingbrand Investments acquired 15 Canada Square, Canary Wharf from KPMG for £400 million in a sale and leaseback transaction. Urban Exposure, the residential development finance and asset management company, announced a listing on AIM to raise £150 million. PRS REIT PLC proposed to raise £245 million on the London Stock Exchange. Triple Point Social Housing REIT proposed to raise £196 million on the Specialist Fund segment of the main market of the London Stock Exchange. Residential Secure Income offered £180 million worth of shares via a placing and offer for subscription on the London Stock Exchange. Supermarket Income REIT offered up to 350 million shares on the Specialist Funds segment of the main market of the London Stock Exchange to raise funds for investment in UK supermarkets. AEW UK Long Lease REIT raised £78.9 million through its initial placing, offer for subscription and intermediaries offer for ordinary shares. Myanmar Strategic Holdings raised US$3.8 million through the issuance of convertible loan notes for conversion into shares on the London Stock Exchange. The UK REIT regime came into force in January 2007. It exempts from corporation tax the income and capital gains of a UK REIT’s property rental business. The income and capital gains of any other business, including acquiring or developing property for sale, is taxed at the main corporation tax rate. While not all property companies are REITs by any means, the largest corporate real estate groups are structured as REITs to benefit from these tax advantages. As a result, M&A involving UK REITs will have specific considerations that will need to be taken into account. d the property rental business must constitute at least 75 per cent of the total profits and assets of the company or the group. There are also diversification rules requiring the business to hold at least three properties, each representing no more than 40 per cent of the total value of the portfolio. To ensure that the property income generated by the property rental business is ultimately taxed, at least 90 per cent of the income profits of the business must be distributed annually by way of dividends. A UK REIT is subject to a tax charge to the extent that it falls short of this. A leverage requirement is also imposed such that the gross income of the UK property rental business must cover the external financing costs of the entire property rental business by a ratio of at least 1.25:1. Again, a tax charge is imposed on the UK REIT to the extent of any excess financing cost. If a UK REIT, whether a single company or a group, becomes part of another REIT, it will remain within the UK REIT regime as long as the conditions continue to be met. A takeover may well cause the company (or parent company of a group REIT) to become a ‘close company’ unless the terms of the acquisition are such that at least 35 per cent of the ordinary shares remain in public hands. However, UK and foreign REITs are now recognised as ‘institutional investors’, which should deal with that point in most cases. In a cross-border context, the impact of the leverage requirement – in that it looks at gross income of the UK property rental business only but takes into account the external financing costs of the worldwide property rental business – will need to be considered. The introduction of UK REITs in 2007 coincided with the beginning of a major downturn in the commercial real estate market. UK REITs were conceived during a UK property boom and consequently faced challenges during the financial crisis. However, as property prices have recovered, there has been a renewed interest in UK REITs as a tax-efficient investment structure, especially following the abolition of a 2 per cent entry charge on seeding assets in 2012. The UK REIT regime is an improvement to the tax environment for UK real estate companies and has consequently had a positive impact on the UK-listed real estate sector. The UK REIT sector now includes some of the United Kingdom’s largest real estate companies, such as Land Securities, Derwent London, British Land, SEGRO, Great Portland Estates, Hammerson, and most recently Canary Wharf Group. The number of UK REITs has grown significantly in recent years (including externally managed UK REITs) to well over 40.
is managed by an investment manager on behalf of all the partners. The investment manager is a separate entity (owned collectively by the private equity fund managers). It is structured as a partnership (often an offshore limited partnership). The manager receives a fee from each fund it manages. The general partner is a company owned by the investment manager and, in compliance with the Limited Partnerships Act 1907, must have unlimited liability for the liabilities of the private equity fund. However, the individual partners cap their liability by investing through a limited company. Individual partners of the private equity fund manager are required to invest their own money directly in the fund (usually between 1 per cent and 5 per cent of the fund). External investors are LPs. Their total liability is limited to the amount of capital they have invested. LPs themselves may be structured as corporations, funds or partnerships. Private equity firms have been major investors in UK real estate in recent years. Investment has been made across a wide range of sectors including hotels, residential schemes, housebuilding, health care, student housing, restaurants, serviced offices, logistics and retail. Private equity firms have continued to raise large amounts of capital for investment in UK and European real estate and investment activity has been buoyed by the relatively low risk opportunities afforded by real estate in terms of a reliable income stream and capital growth. When investors acquire or dispose of real estate in the United Kingdom, the majority of the deals do not involve the transfer of title to the relevant property from the seller to the buyer. While smaller deals may involve the direct transfer of real estate assets, for a number of reasons (the main driver is often tax, as outlined below), the acquisition or disposal of real estate assets is made through share purchases of corporate vehicles that own the property in question. It is unusual for there to be a direct transfer of real estate. Share acquisitions with cash consideration remain the predominant form of real estate transaction structure. This is likely attributable to the relative simplicity of completing a transaction structured as a share acquisition and, from a valuation perspective, the certainty of receiving cash consideration. Fixed-price transactions (often in the form of ‘locked boxes’) are the structure of choice for private equity sellers, although they are increasingly used by trade sellers conducting auctions. Earn-outs and deferred consideration are not common features of the UK real estate M&A market. Post-completion adjustments to the purchase price are also a common feature, particularly where there is a delay between signing and completion (see below). Adjustments are most commonly made to account for variations in working capital and net debt. 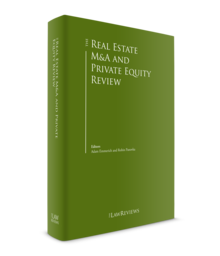 The use of escrow structures has also increased in the real estate private equity M&A market as a way to make contractual claims in respect of warranties and post-completion purchase price adjustments. As noted, typically real estate assets will change hands through the sale of the shares in a corporate vehicle that owns those assets. As with any share deal, the buyer will take on the target’s existing liabilities and commitments and the seller will provide warranties and certain indemnities. The title to the real estate assets will usually be certified by the vendor’s counsel. The extent of the sales and purchase agreement (SPA) provisions will vary depending on the nature of the transaction, the real estate assets in question and the due diligence undertaken. However, there are a number of aspects to consider. A number of conditions may need to be satisfied before a real estate transaction can complete (such as obtaining planning permission, third-party consents or even practical completion of a property development). Any such conditions must be satisfied or waived before the real estate transaction can complete. management of the underlying properties is required and, if so, whether the buyer will exercise control. Where there is a split between signing and completion, this may affect whether the buyer is able to negotiate a rescission right, mentioned above, during that time. Where a seller is required to obtain shareholder approval for a real estate transaction after signing but before completion, it will be difficult for them to argue that during this period the buyer should face the potential risks and be unable to rescind. In contrast, where the reason for a split is as a result of the time required by the buyer (e.g., to procure debt finance), it is less likely the buyer will be able to negotiate a rescission right for anything other than material breach of any restrictive conduct provisions. In UK real estate acquisitions, buyer protections are particularly important as the buyer is not afforded any statutory or common law protection on acquisition; caveat emptor (buyer beware) applies. Where the buyer purchases a target group and is to inherit all related obligations, liabilities and commitments, a robust package of warranties and appropriate indemnities will be required from the seller. These will normally be limited to the corporate vehicle and taxation matters; the buyer will usually be expected to satisfy itself on title to the real estate assets through a normal due diligence exercise or reliance on certificates of title issued by the vendor’s lawyers. Recently we have seen a move towards title insurance as a way for the buyer to deal with title due diligence, sometimes in combination with purchaser due diligence or certificates of title, or both of these. A combination of approaches is not uncommon on portfolio deals with properties of various values or significance. Although sellers (particularly private equity sellers) will not want to provide a large number of warranties on the sale of real estate assets, they are important to provide the buyer with some contractual protection. An SPA will not generally include long-form property warranties; the buyer’s property enquiries will be answered by the seller in the form of representations. Buyers are increasingly succeeding in extending the scope of warranty coverage, although sellers often succeed in disclosing all due diligence information against such warranties. Private equity sellers have also conceded business warranties on occasion (however, these tend to be in respect of identified issues that cannot be addressed through further diligence or otherwise reflected in the price). The repetition of warranties at completion is usually limited to ‘core’ warranties regarding title to the shares or real estate assets and the capacity and authority of the seller to enter into the transaction. Where a buyer identifies (through due diligence) a particular risk or liability that it is unwilling to assume (e.g., environmental risks, or planning consents or permissions) and that risk is not easily quantifiable, specific indemnities will be sought, shifting the exposure to the seller. Warranty claims are difficult to make in practice, so indemnities are preferable from the buyer’s perspective. Sometimes title insurance to protect against a specific title defect can be obtained. The limitations on a seller’s liability under an SPA will be dependent on the particulars of each transaction. In practice, however, the parties will agree that certain warranties (i.e., core warranties) will be capped at the overall consideration for the deal. Depending on commercial and competitive pressures, there may be a different cap on liability for other warranty breaches (e.g., 15 to 20 per cent of the overall consideration). General warranties are likely to have a duration of 18 months to two years, while tax warranties are more likely to have a duration of four to six years. There is also likely to be a de minimis threshold that must be reached before a claim is brought. As noted, the seller’s exposure under the warranties will be limited by the disclosures made in the disclosure letter (which the buyer will ensure are sufficiently detailed so that a view can be taken on its liabilities). There is a growing tendency for both sellers and buyers to obtain warranty and indemnity insurance in the UK M&A market. Insurers such as Aon and Willis are increasingly marketing their willingness to offer warranty insurance, although they expect that careful due diligence is carried out in the normal way by the buyer. This trend has been driven by sellers seeking a clean exit – a broader set of warranties can be presented with limited post-completion financial exposure. Similarly, buyers are arranging insurance to supplement or cover gaps in the protection provided by sellers – securing sufficient protection can allow buyers to proceed with a transaction without raising a seller’s exposure and potentially prejudicing the competitiveness of any offer. additional charges over certain contracts (such as leases, insurance policies and development and construction contracts). Depending on the circumstances, lenders may also seek protection against borrower default through conditions precedent and direct covenants in the facility agreement, property valuations, parent company guarantees and bonds, cash collateral and by obtaining floating charges from the parent company. Where development and construction is anticipated, lenders may also require approval of material development documentation as a condition precedent to drawdown and may expect to receive collateral warranties or third-party rights from contractors, designers and key sub-contractors. Step-in rights may also be sought to take over a contract in the event of default. Stamp duty land tax (SDLT) is payable by the buyer of commercial real estate and is a percentage of the purchase price, varying depending on the consideration paid for the property. SDLT is currently payable at 2 per cent on the portion of consideration between £150,001 and £250,000, and 5 per cent on the portion of consideration above £250,000. For investors to avoid paying high tax rates for individual real estate assets, it is better for the shares in the vehicles themselves to change hands. SDLT does not apply to the purchase of shares in companies holding real estate assets. The rate of stamp duty on the transfer of shares in a UK-incorporated company is 0.5 per cent. If real estate assets are sold and purchased directly, the default position is that the sale or purchase in the United Kingdom is not subject to VAT, though owners can opt to tax the property at the standard rate of 20 per cent. Generally, most sellers opt to tax. Where a property is let to tenants, VAT can be mitigated by ensuring the sale is treated as outside the scope of VAT as a transfer of a business as a going concern, provided the buyer continues letting the business and opts (and notifies HMRC that it has opted) to tax. Otherwise, even if the buyer can recover all of its VAT, the VAT amount will count towards the SDLT calculation and thus create an absolute cost in all cases. Interest charges on borrowings are, generally speaking, deductible expenses for tax purposes, so gearing will generally result in tax efficiency. Many real estate investors introduce borrowing to achieve this result. In such circumstances, it is important that any loan arrangement is ‘at arm’s length’. Loans that do not meet that commercial threshold will not qualify as deductible. With effect from April 2017, the UK introduced a new restriction on the deductibility of debt finance for corporation tax purposes, similar to those that have existed for some time in other jurisdictions (such as Germany). The UK regime limits interest deductions to 30 per cent of a group’s taxable EBITDA. The intention is more to discourage groups shifting a disproportionate amount of debt into the UK than to attack debt finance as such. Accordingly, groups that are highly geared on a worldwide basis may benefit from making an election that permits the use of a percentage based on the ratio of the group’s net interest expense to its global accounting EBITDA. There is also an exemption for third party debt incurred by ‘infrastructure’ companies that, somewhat generously, extends to companies carrying on a UK property letting business (provided the leases in question are to third parties and do not exceed 50 years duration). A significant change to the taxation of offshore investors in UK real estate was announced as part of the 2017 Budget. With effect from April 2019, non-resident companies will be taxable on profits and gains arising from holding or disposing of UK real estate in the same way as UK resident companies. Currently, non-residents pay only income tax on rents; and, although disposals of residential property by non-residents have been subject to capital gains tax since 2015, the new tax charge will cover all forms of UK property. A more surprising part of this package is that non-residents that dispose of indirect interests in UK property (e.g., shareholdings in ‘property-rich’ companies) will also be subject to UK tax on any gain. The current proposal is that a company will be property-rich if more than 75 per cent of its gross asset value is attributable to UK real estate (whether held directly or via subsidiaries). A non-resident will be subject to tax on any gain if it holds a 25 per cent or greater interest in the company, or has done so within the preceding five years and with interests held by connected parties being aggregated. The UK has not before attempted to tax non-residents in this way, and this part of the proposal has received much negative comment. More detailed revised proposals and draft legislation are expected soon and it is hoped that some of the criticisms will have been taken on board. Brexit will, of course, remain the dominant political, economic and legal issue for the foreseeable future. The government’s poor result at the 2017 general election means that the Prime Minister does not have the ‘stronger mandate’ she had hoped for to drive through Brexit. Instead, a resurgent opposition and continuing division within her own party have magnified the uncertainty. The Prime Minister has confirmed that the UK will leave the EU on 29 March 2019; however, just about everything else in relation to Brexit remains unclear as negotiations with the EU and the UK’s trade partners continue. Real estate M&A and private equity activity will continue to be affected in the build-up to the UK’s separation from the EU. Although there will continue to be risks along the way, there will also be opportunities that will boost the market. The uncertainty surrounding Brexit needs to be considered in the light of global economic and political concerns. Overseas investors will continue to look for attractive assets and income streams and UK real estate has remained a global investment hotspot. Concerns about Brexit and how the UK will fare outside the EU have been offset by a number of factors, including the ongoing weakness of the pound, low unemployment, historically low interest rates and positive economic data. Continuing global political and economic uncertainty, including concerns about North Korea, Chinese and other emerging market economies, the Trump administration, oil prices, tensions in the Middle East and political instability in Europe, all mean the UK real estate will retain its appeal for investors. Although it is impossible to predict what the next 12 months have in store, the outlook for the real estate M&A and private equity markets is generally more positive than the prevailing mood following the initial effect of the 2016 EU referendum result. However, this cautious optimism is not shared by all the sectors and the outlook for retail, particularly on the high street, remains negative. The government must work hard to ensure that the UK remains competitive and investment in infrastructure is essential. A new runway at Heathrow has finally been confirmed as the preferred option for expanding the UK’s aviation capacity. As Crossrail (now known as the Elizabeth Line) approaches completion, government backing for Crossrail 2 and the Northern Powerhouse Rail network is still awaited. The government must also address the UK’s chronic housing shortage. The continued availability of a skilled workforce is of fundamental importance to the UK economy and will be a key factor for businesses considering whether to retain a substantive presence in the UK. In addition, the construction industry has been reliant on labour from Europe for a number of years. In short, any tightening of restrictions on immigration will affect the UK’s ability both to construct new buildings and also to attract businesses to occupy them. Competition from other countries should not be underestimated and Germany is likely to be the biggest European beneficiary of any movement of the financial services sector from London. There is, of course, also strong competition from further afield and London’s true rivals remain global cities such as Hong Kong, New York and Singapore. Although risks and challenges remain, UK real estate will retain its appeal for overseas investors and maintain its key role in the global M&A and private equity market. 1 Richard Smith is a partner, Ed Milliner is a senior counsel and Graham Rounce is a professional support lawyer at Slaughter and May.